In 2015 the National Childbirth Trust had over 100,000 parents attend their ante and postnatal courses. With the help of over 15,000 volunteers the NCT currently campaign to improve maternity care and give every parent the chance to make informed choices about their child. The NCT has grown significantly in size and influence since its formation in 1956. It was founded in a climate of growing concern about shortcomings of NHS maternity services. It was perceived that NHS medical staff were failing to give expectant mothers enough information to make educated choices about their bodies or baby’s birth. Criticism of the treatment of expectant mothers was voiced from the earliest days of the NHS. One such critic was the mother and author Sarah Campion, who had her first baby in 1949, just a year after the formation of the NHS. Sarah Campion was a pseudonym for the author Mary Rose Coulton. Coulton was born in England in 1906 and lived in Auckland, New Zealand, from 1959 until her death in 2002. Her published works included the ‘Burdekin Trilogy’, an Australian classic which recalled nineteenth century life in the gold-mining towns of Queensland, as well as a biography of her father, G. G. Coulton. However it is Campion’s book National Baby, published in 1950, which has significance for historians of the NHS. 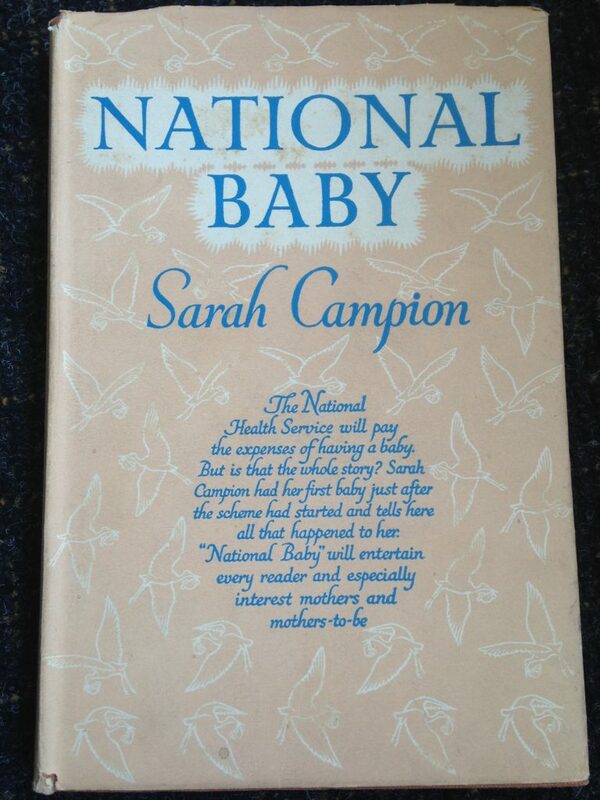 National Baby is Sarah Campion’s first-hand account of pregnancy and birth under the new NHS. It is written as a diary, and follows Campion’s experience of antenatal clinics, birth, hospital life, and postnatal services. She reflects on her treatment by staff, her relation to other mothers, and her opinions of the NHS. Campion ultimately urges other mothers to use the facilities offered by the NHS, despite mixed opinions about its quality. National Baby is valuable because it is rare to have such an in-depth and eloquent record of the experience of mothers under the first few years of the NHS. Campion drew attention to many of the complexities and challenges of giving birth under the new service. Although much of her account is highly individual, many of her experiences were similar to those of other women. Much of Campion’s account is highly critical of the NHS. This criticism is best shown by her concept of the ‘Hospital Mind’. The ‘Hospital Mind’ was a state of thinking which considered doctors and nurses as sacred. Medical professionals were deemed to know what was best for the patient, and the mother was seen as comparatively inferior and ignorant. National Baby explores how the ‘Hospital Mind’ was a widespread view amongst doctors and nurses in the late 1940s. Campion described how the ‘Hospital Mind’ meant doctors refused to tell mothers information about their own bodies. For instance, at the antenatal clinic Campion was told ‘scoldingly’ by a nurse not to look at her medical file. Campion criticised staff for overlooking women’s natural desire to learn about their bodies, suggesting their inquisitiveness had ‘been stultified by the attitude of Authority.’ Similarly, Campion suggested that mothers’ emotional needs were not met by NHS staff, and that their treatment lacked any personal care. Such a perception was epitomised by Campion’s account of an examination by her doctor. She wrote of being examined at speed, ‘like an object on an assembly belt’. Campion was tapping into a widespread, but often unspoken criticism of the doctor-patient relationship. Doctors medical knowledge gave them power in their interactions with mothers. In turn this power imbalance often prevented mothers from protesting the clinical care they received. Another key theme raised in National Baby is that of class, and how it affected mothers’ experience of the NHS. Hospitals and GP waiting rooms acted as a mixing-pot of different women from different backgrounds who were often interacting with each other for the first time. Campion draws attention to aspects of class conflict and class unity within maternity wards in the late 1940s. Middle-class women such as Campion are particularly interesting cases because their values were challenged by the new NHS. Campion, as a member of the professional classes, often felt ‘resented’ by working-class ward mates. She writes that the middle classes ‘were thought to be getting something for nothing, at the expense of those who deserved it more.’ The mixing of women from different backgrounds in the NHS allowed tensions to emerge over whether state-funded healthcare was a right for all, or only some. However, there were also significant points of overlap between mothers of different classes. There was unity in the intention that all should receive the same service, regardless of income or class. The NHS intended to remove inequalities in access to, or quality of healthcare among Britain’s classes. This objective meant there was no longer a humiliation associated with receiving state-funded healthcare provision, as there had been with the use of the workhouse hospital prior to the NHS. Class unity was ultimately demonstrated by Campion’s call for women of all backgrounds to make use of the NHS. For Campion it was crucial that the NHS should not just be used by working class mothers. She encouraged women to overlook their differences and all use the new service. This optimistic conclusion appears to conflict with the majority of National Baby, which criticises the NHS for impersonal care. However, such criticism did not seek to undermine the NHS, instead it aimed to inform the reader about the reality of giving birth under the NHS, in the hope of eventually improving the service. Although Campion complained about the lack of personal service, she understood that this may be a sacrifice worth paying for a birth with experts, free at the point of use. Campion’s mixed emotions are important to note because they demonstrate the psychological complexity of being part of the first generation of NHS users. Mothers using the NHS for the first time felt conflicting feelings about the value of the new healthcare system. National Baby is a product of one mother learning how to feel about the NHS, and working out an overall conclusion about its worth. Such an interesting piece! I am particularly intrigued by the observations about class and its role in perceptions of who should be able to access the NHS in its early years. They remind me very much of later tensions around migrants’ (and especially migrant mothers’) access to the Service. I inherited a copy of National Baby from my mother who gave birth to me at Queen Charlotte’s Maternity Hospital on 3 March 1949 and I am pretty sure appears in the book as “Molly Souttar”, which makes me “Aloysius”. I agree with your assessment except on one point. I felt that criticism of the Hospital Mind was directed at the medical profession and hospitals generally as they were at that time, rather than at the NHS. Yes, her only experience of childbirth was of the NHS, but I don’t get the feeling from her writing that she thought things were different in hospitals elsewhere, and she had travelled widely. This is fascinating. It’s wonderful to hear from someone who actually appears in the book. I guess this makes you a ‘national baby’ yourself. Did the author give the book to your mother? Did your mother know that she was going to be writing a book about her experiences in the maternity hospital? We’d love to find out more about this story. On the ‘Hospital Mind’ and the NHS, your point is a very good one. The main criticism is certainly directed at the ‘Hospital Mind’, and this is something that clearly goes well beyond the NHS. That said, the book is also full of interesting indications of how someone like this was also trying to make sense of what the NHS itself represented and meant. We think it’s a really quite significant piece of evidence in that regard: a fascinating window on the very first years of the service.